At least nine workers have died and nearly two dozen are feared trapped in a coal mine which has collapsed in the eastern Indian state of Jharkhand. The incident happened late in the evening on Thursday at a government-owned mine in Godda district. Efforts are continuing to reach the miners, who are believed to be still trapped, officials told BBC Hindi. Jharkhand has some of India's biggest coal mines, but safety standards are not always strictly followed. 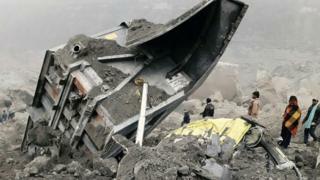 "So far, nine bodies have been recovered," RR Amitabh, a top official at the mining firm, told Reuters. He added that the rescue operation was under way and the exact number of people trapped had yet to be ascertained. Reports say the death toll is likely to rise. India's National Disaster Relief Force (NDRF) was at the scene and assisting local authorities in the rescue operations. SK Singh, the general manager of the Rajmahal Open Cast Mines, told the Associated Press that heavy smog prevented rescue workers from entering the mine until early Friday morning. Jharkhand Chief Minister Raghubar Das said he was monitoring the rescue operation. He said an investigation into the mine collapse would be ordered.